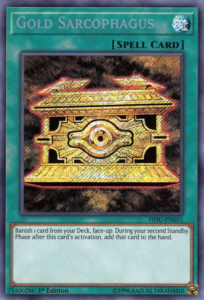 Home Featured Articles Yu-Gi-Oh! Hidden Summoners: What You Should Know! The final new product of 2018 (if you don’t count the Soul Fusion Special Edition). Hello Pojo Readers, Crunch$G here back to tell you what you should know about the newest Yu-Gi-Oh product. This time around is based on the new set, Hidden Summoners. 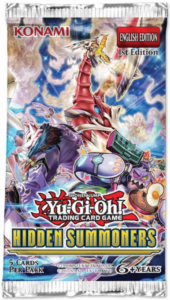 In this set, we get archetypes based on Ritual, Fusion, and Synchro Summoning and each of these new archetypes get their own new Link Monsters as well to help them out even more than just using other more generic Links. The three archetypes in this set are interesting to say the least, one of which continuing the legacy of a very classic card, so here I will talk about all three of them. The first new archetype in this set is the Ritual Archetype, Nephthys. Now you might be thinking of the original Sacred Phoenix and this archetype seems to work well with the old Sacred Phoenix with their main deck monsters, who destroy cards in your hand to gain effects and give you an effect on your next Standby Phase after they are destroyed by a card effect. Matriarch of Nephthys lets you destroy a card in hand to revive a Level 4 or lower Nephthys from the GY with negated effects and can be Special Summoned from the GY the next Standby Phase after an effect destroys her. Disciple lets you destroy a card in hand to search a Nephthys monster and when destroyed lets you search a Nephthys Spell/Trap on your next Standby Phase. Chronicler gets your Nephthys cards back when destroying a card in hand and adds a Nephthys card from your GY to your hand the next Standby Phase after an effect destroys her. Defender destroys a card in hand to Special Summon a Level 4 or lower Nephthys from your hand and can destroy a Nephthys from your deck the next Standby Phase after an effect destroys her. The next part of this support is their new Rituals and Links. Devotee of Nephthys is a Level 2 Ritual that can be Ritual Summoned with Rebirth of Nephthys (will talk about that in a bit) and when Ritual Summoned, you can Special Summon a Nephthys from your deck, but Devotee is destroyed in the End Phase. Devotee also can let you destroy a card in hand to Special Summon itself from the GY. 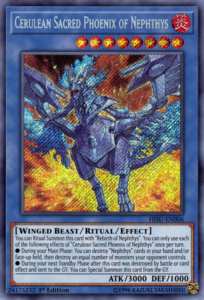 Their Level 8 Ritual, Cerulean Sacred Phoenix of Nephthys, can also be summoned with Rebirth of Nephthys and can destroy Nephthys cards in your hand and/or face-up on your field to destroy an equal number of monsters your opponent controls and during the next Standby Phase after Cerulean is destroyed by battle or card effect, it can be Special Summoned from the GY. Nephthys, the Sacred Preserver is the archetype’s Link-2 with two downward pointing arrows that requires 2 Nephthys monsters and during the Main Phase it was Link Summoned, you can either add a Level 8 Winged-Beast from your deck to your hand and then you can get back a Ritual Spell from the GY or you can destroy a Nephthys monster this card points to and revive a different Nephthys monster with its effects negated. Their final Link Monster is Nephthys, the Sacred Flame which is a Link-3 with three downward pointing arrows that requires 2+ monsters, including a Ritual Monster, and prevents your opponent from targeting Nephthys monsters in the Main Monster Zones for attacks while it is in the Extra Monster Zone and gains the following effects based on the number of Ritual Monsters used for the Link Summon: 1+ Ritual gives it battle destruction immunity, 2+ Rituals gives it 1200 ATK and effect destruction immunity, 3 Rituals gives it another 1200 ATK and targeting immunity. The final part of this archetype is the Spell/Trap support. 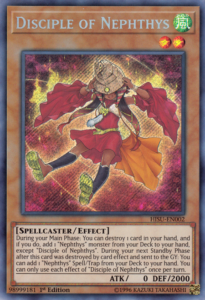 Rebirth of Nephthys is their Ritual Spell that lets you Ritual Summon your Nephthys Ritual Monsters by tributing monsters whose Levels equal or exceed the Ritual Monster’s Level and then if you tributed Devotee of Nephthys or Cerulean Sacred Phoenix of Nephthys, you can destroy 1 card on the field. Last Hope of Nephthys is a Normal Spell that lets you target any other Nephthys card you control and an opponent’s card and destroy them. 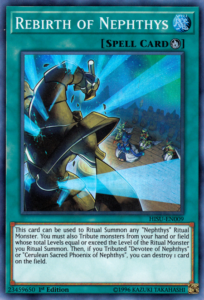 Finally, Awakening of Nephthys is a Continuous Trap that gives your Nephthys monsters 300 ATK and if it is face-up and destroyed by a card effect, you can Special Summon a Nephthys monster from your hand, deck, or GY but it is destroyed in the End Phase. The next archetype is the Fusion Archetype, Prank-Kids. This archetype is based around three Main Deck monsters: Fansies, Lampsies, and and Dropsies (Rocksies will be the fourth in Savage Strike) and each of them can summon a Prank-Kids from the deck with a different name by doing various things (Fansies sends a Prank-Kids card from the deck to the GY, Lampsies burns the opponent for 500, and Dropsies will give you 1000 LP). These are the three monsters you so far use for their Fusions and Links. Rocket Ride is a Fusion that requires 2 Prank-Kids monsters as Fusion Materials and can lose 1000 ATK to deal a direct attack the turn it is Fusion Summoned and during your turn, you can tribute it to revive two non-Fusion Prank-Kids with different names but they can’t attack the turn they are revived. Weather Washer is another Fusion that requires 2 Prank-Kids monsters and when your Prank-Kids monsters declare an attack, your opponent cannot use cards or effects until the end of the Damage Step, also during your opponent’s turn Weather Washer can be tributed to revive two non-Fusion Prank-Kids and give them immunity to destruction in battle the turn they are revived. The final Fusion is Prank-Kids Battle Butler, who specifically requires the three Prank-Kids main deck monsters I mentioned are in this set, that must be Fusion Summoned and during either player’s turn can be tributed to destroy all monsters your opponent controls and if your opponent sends Battle Butler to the GY before you can even do that, you can revive any non-Fusion monster. Prank-Kids Dodo-Doodle-Do is a Link-2 with an arrow pointing down and to the left and requires two Prank-Kids monsters and when Link Summoned searches for any Prank-Kids Spell/Trap and during your turn can be tributed to add back two non-Link Prank-Kids monsters from your GY to your hand. 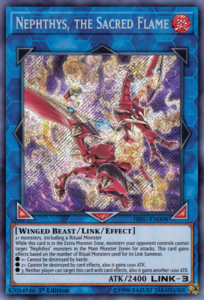 Bow-Wow-Bark is their other Link-2 that needs two Prank-Kids monsters and has arrows pointing down and to the right and gives a Prank-Kids monster it points to 1000 ATK and during your opponent’s turn can be tributed to add back from your GY to your hand 2 non-Link Prank-Kids monsters and then the Prank-Kids monsters you control are immune to effect destruction from your opponent that turn. 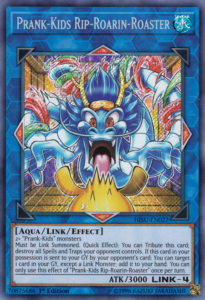 Finally, they have the Link-4 Rip-Roarin-Roaster that requires 2+ Prank-Kids monsters and points up, down, left, and right that must be Link Summoned and during either player’s turn can be tributed to destroy all Spells/Traps the opponent controls and when your opponent sends it to your GY, you can add back any card from your GY to your hand. Next is the Prank-Kids Spell/Trap support. Their Field Spell, Prank-Kids Place, lets you add a Prank-Kids monster from your deck to your hand upon activation, gives all your monsters 500 ATK when you Fusion Summon a Prank-Kids monster once per turn, and debuffs your opponent’s mosnters by 500 ATK when you Link Summon a Prank-Kids monster once per turn. Prank-Kids Pranks is a Continuous Spell that lets you discard a Prank-Kids card to Special Summon a Prank-Kids Token (Pyro/FIRE/Level 1/ATK 0/DEF 0) and during your End Phase lets you shuffle back into your deck three Prank-Kids cards from your GY to then draw 1 card. 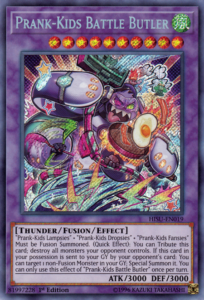 Prank-Kids Pandemonium is their Quick-Play Fusion Spell that lets you Fusion Summon a Prank-Kids monster during the Main Phase using Prank-Kids monsters in your hand or on field as material, but you are locked to only summoning Prank-Kids monsters for the rest of the turn. 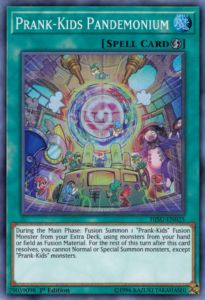 Finally, Prank-Kids Plan is a Continuous Trap that during the Main Phase lets you Link Summon a Prank-Kids monster immediately using Prank-Kids monsters you control as material and when Plan is in the GY when your opponent declares an attack, you can banish Plan from the GY to shuffle any of your Prank-Kids cards in your GY into the deck and then make the attacking monster lose 100 ATK per card. 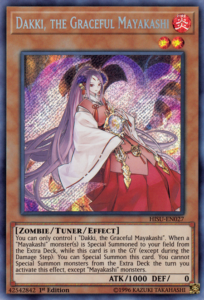 The final archetype is the Synchro archetype, Mayakashi, which is full of Zombies to fit in well with the newest Structure Deck. In the Mayakashi main deck are five Effect Monsters, two of which are Tuners (you can only control one of each Tuner). Dakki, the Graceful Mayakashi is a Level 2 Tuner that revives itself when you summon a Mayakashi from the Extra Deck but you can only summon Mayakashis from the Extra Deck the turn you use that effect. Tsukahagi, the Poisonous Mayakashi is similar to Dakki in almost every way as a Level 2 Tuner, only Tsukahagi is revived when a Mayakashi is destroyed. Hajun, the Winged Mayakashi is a Level 1 monster that summons a Mayakashi from your deck upon his summon except Hajun and locks you into Special Summoning Mayakashis from the Extra Deck during the turn. Shafu, the Wheeled Mayakashi is a Level 3 that is similar to Hajun, but instead revives a Mayakashi in Defense Position with its effects negated. Yasha, the Skeletal Mayakashi is a Level 5 that lets you discard a Mayakashi to Special Summon it from the hand and then lock you into Mayakashis from the Extra Deck for the rest of the turn. The Mayakashi Extra Deck monsters are Synchros with levels of 3, 5, 7, 9, and 11 and also have a Link Monster. Now, all the Synchros only allow you to control one of each of them and all revive themselves by banishing a Zombie when a Synchro Monster with 2 Levels higher (a Link Monster in the case of the Level 11 Synchro) is destroyed sent to the GY. Now, all the Synchro Mayakashis have effects when revived, so I’ll just mention them here in order from lowest level to highest. Oboro-Guruma, the Wheeled Mayakashi gives all your monsters protection from battle destruction upon revival. Tsuchigumo, the Poisonous Mayakashi makes both players mill 3 cards. Tengu, the Winged Mayakashi destroys a Spell/Trap your opponent controls. Yoko, the Graceful Mayakashi destroys a monster your opponent controls. 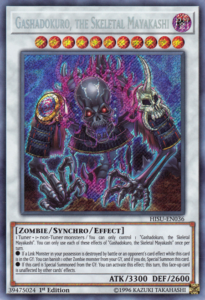 Gashadokuro, the Skeletal Mayakashi is unaffected by other card effects the turn it is revived. Now, for the Link Monster. Yuki-Onna, the Ice Mayakashi is a Link-2 with two downward pointing arrows and requires 2 Mayakashis as material and you can only control one of it as well, but while it points to a Synchro Monster it cannot be targeted for attacks and if a Synchro Monster in your possession is destroyed by battle or card effect, you can target a monster on the field and half its ATK and DEF for the turn. Finally the Spell and Trap for this archetype. Mayakashi Return is a Normal Spell that takes a Mayakashi from your deck and either add it to your hand or send it to the GY. Mayakashi Metamorphosis is a Normal Trap that makes you discard a card to revive a Mayakashi from your GY or banished and give it protection from your opponent targeting it for the turn and locks you into only Special Summoning Mayakashi monsters from your Extra Deck for the turn. I mean, Sacred Phoenix of Nephthys is obviously in here. Night’s End Sorcerer gets its first reprint outside of an OTS Pack. Shiranui Spectralsword is in here to prepare you for the new Shiranui support and Shiranui Spiritmaster finally gets a holo printing. Preparation of Rites is here for the obvious generic Ritual Support, along with Manju of the Ten Thousand Hands. Ultra Polymerization is a decent reprint. De-Synchro gets a more budget Super Rare reprint. Phoenix Wing Wind Blast has another Super Rare reprint to devalue the Champion Pack version even more. Thunder Dragon is a good Super Rare in this set. Tatsunoko is a good reprint in this set. Gold Sarcophagus gets its first Secret Rare printing in this set. Onslaught and Circle of the Fire Kings are finally reprinted outside the Fire King Structure Deck from over five years ago. Finally, you get a reprint for Rivalry of the Warlords and Gozen Match, which were becoming expensive commons and now they have a holo printing. To be honest, this set isn’t good for meta relevance. Nephthys is too slow if I’m being honest and is likely getting added to Duel Links like most of the cards from these sets do. Prank-Kids might get some Regional tops at most, but it needs more to do well at the YCS Level I feel, and Prank-Kids Rocksies will not be enough. Mayakashi will likely have its best success with FTKs using Soul Absorbing Bone Tower and Synchronized Realm, cause the archetype restricts you to the archetype, and that isn’t very pleasant cause we don’t need more FTKs. The reprints are good, though, especially Rivalry of the Warlords, Gozen Match, and Gold Sarc. I really do like these archetypes, but I’d only buy product if you want all three archetypes, cause everything in this set is likely going to be cheap. The archetypes are cool, but not good enough for the meta, yet at least, especially for Prank-Kids.